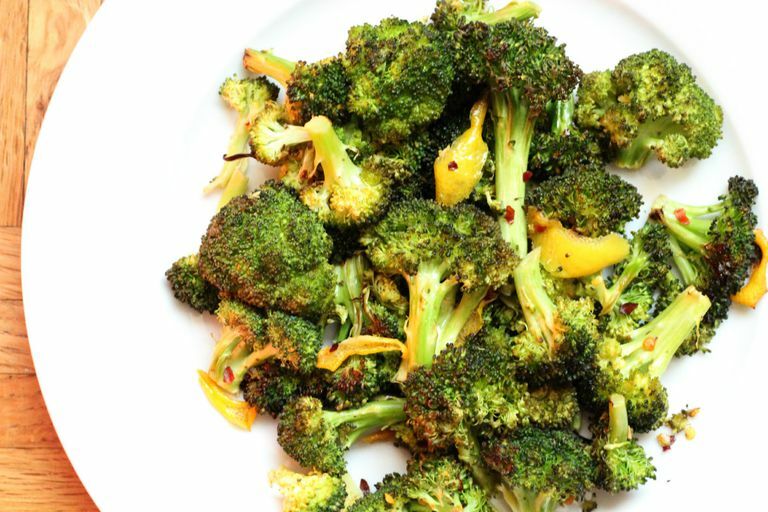 Lemony roasted broccoli will take your taste buds for a refreshing ride. Lemon juice adds a burst of flavor on it's own, but the the lemon peel takes the citrus level up a notch. This side dish is a wonderful anti-inflammatory addition, as the lemon contains vitamin C and serves as an antioxidant. In a large mixing bowl, combine broccoli florets with oil, salt, lemon juice, lemon peel, red pepper flakes, and oregano. Mix all the ingredients together until thoroughly combined. Pour the broccoli mixture onto the lined baking sheet and spread out in one even layer. Bake at 375F for 20 minutes or until broccoli is lightly browned and crispy, flipping the mixture once halfway through. Remove from oven and enjoy hot or at room temperature. You can easily modify this recipe to your personal taste and liking. If you do not wish to add lemon, you can simply substitute orange juice and orange peel for a different but delicious citrus flavor. Lemon or other citrus zest can be used in place of the lemon peel. In order to get the zest from citrus (lemon, lime, or orange), you will need a microplane grater or zester, which will grind the peel into fine pieces. It is important not to grate the white colored part of the peel as it is very bitter. You get a great amount of flavor from the citrus skin, as that is where the oils are. To add more crunch to the broccoli you can add panko breadcrumbs to the mixture before baking. Although this recipe is naturally free from gluten, if you need to follow a gluten-free diet, you can add gluten-free breadcrumbs. You can replace the sea salt with a light sprinkle of Parmesan cheese to make it a cheesy roasted broccoli dish without altering the nutritional value too much. If you are vegan or want to avoid dairy, consider adding in nutritional yeast for a nutty and cheesy flavor. The recipe would be just as good if it were sauteed in a frying pan, rather than baking. I personally love how the oven does most of the work and you don't have to stand over the pan and continuously stir the mixture. Who doesn't love to save time? One of my favorite tricks for saving time is to use pre-chopped vegetables. You should also used just one bowl for this recipe, which leads to easier clean-up. I recommend pairing the roasted broccoli with just about anything. It goes great as a side dish to any lean protein you wish to pair with it—baked or grilled fish works great in the summer. Leftovers would also be delicious in a stir-fry or your own take on homemade burrito bowls. This broccoli would add huge flavor to cold pasta salad as well.